Heat the oven to 400°F. While the oven is heating, stir the soup, milk, half the Parmesan cheese, garlic powder and black pepper in an 11x8x2-inch baking dish. 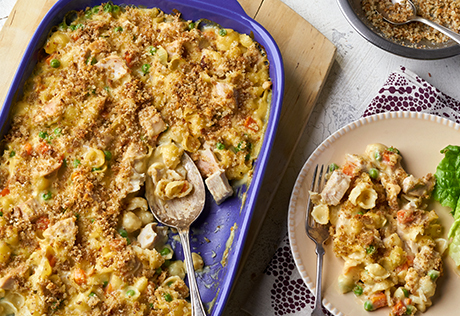 Stir in the macaroni, turkey and peas and carrots. Season the mixture as desired. Bake for 20 minutes. Stir the macaroni mixture. Stir the stuffing, remaining Parmesan cheese and butter in a small bowl with a fork. Sprinkle the stuffing mixture over the turkey mixture. Bake for 5 minutes or until stuffing mixture is lightly browned.